Varsity players please let Coach Evan know any conflicts right away as rosters for all games will be determined for the season. Same for JV players, let Coach Jeff know. 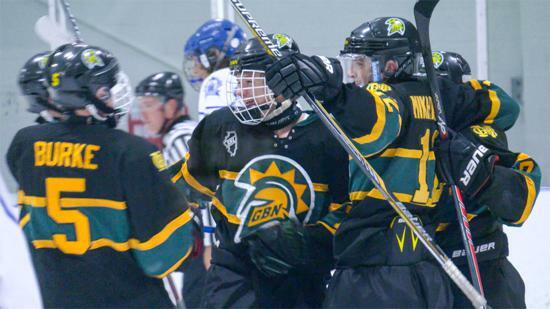 Glenbrook North coach Evan Poulakidas always knew he had a tough competitor in defenseman Tim Burke, but after the Spartans lost their state semifinal game to eventual state champion Loyola Academy last year, Burke showed him something more. A player can play for himself or play for his team. Burke chooses the latter, and the loss to Loyola stung for an additional reason. Now in his fourth season as a varsity player, Burke provides a physical presence, a big shot, and stalwart defensive play for the Spartans. That’s a far cry from three years ago, when he roamed the ice as a 5-foot-4 freshman. Burke hit the mother of all growth spurts later that year and now stands at 6-foot-2 and 170 pounds. That growth turned Burke from a small freshman who largely had to avoid getting hit, to a player able to provide a physical presence on the ice. Burke and fellow senior David Wilcox make up one of the best defensive duos you’ll find anywhere in Illinois. The two have played hockey together since first grade and while Wilcox is good friends with the Burke he knows off the ice, he appreciates a whole different person once the skates are laced up. Currently ranked third in Illinois in Ross Forman’s Top 20, Glenbrook North relies on a defense that features Wilcox and Burke in front of goalie Brennan Nein. 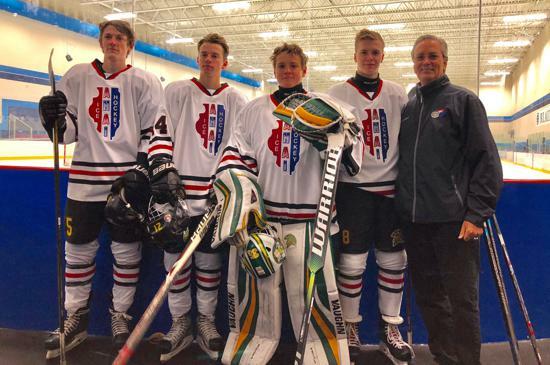 All three played on Team Illinois in September, along with teammate Mike Day, in a North American Hockey League showcase tournament Sept. 20-23 in Minneapolis, MN. Team Illinois went 4-0 in the tournament and Burke had six points in four games in front of scouts from various junior hockey programs. Burke enjoyed putting up some offensive stats in Minneapolis, but that’s never been what he’s all about as a player. Defensemen obviously aren’t showered with the accolades that offensive players receive, but they still enjoy the less obvious moments that stand every bit as important. Poulakidas puts it simply: “Tim is important to every aspect of our team game,” he said. Burke and Wilcox make up one of the best defensive duos in the high school game and Burke appreciates Wilcox’s smarts, ability to move the puck, and leadership. Wilcox currently has 19 goals and 22 assists for GBN and is second on the team in points. He credits Burke for his role in those numbers. With roughly five weeks remaining in the final season of his high school career, Burke is looking forward next year to either a stint in junior hockey or a freshman year at either the University of Iowa or the University of Kentucky. But for now, he’ll bleed dark green and gold for a Spartans program he’ll miss once his high school career comes to a close. The fifth time was the charm for Glenbrook North, finally. The No. 3-ranked Spartans shined in one of the most high-profile games of the season – the championship game of the 25th annual High School Holiday Hockey Classic, presented by the Chicago Blackhawks Foundation. GBN defeated No. 1-ranked New Trier Green on Dec. 29 to capture the title in the prestigious 16-team, 4-day tournament held The Edge Ice Arena in Bensenville. GBN enters 2019 on a 7-game winning streak, its last loss coming Dec. 15, at home against …. Green. The Trevians have seemingly had the Spartans number all season. The two teams first met in a preseason tournament on Sept. 9, and the Trevians coasted to a 5-0 win. In other games between the two teams, the Trevians have won 4-3 and 3-2 in overtime. “Anytime you can defeat New Trier, you’ve done something special; they’re that good,” said GBN head coach Evan Poulakidas, who has now led Spartan teams to four championship game victories in the annual post-Christmas tournament. “It was just a great hockey game, a cleanly physical game – everything you’d think a championship game would be. We were fortunate to be on the winning side. The Spartans struck first, but the Trevians answered. It was 2-1 and GBN iced the victory with an empty-net tally. “You have to play three full periods against New Trier; you cannot let up at all – and we were able to do that,” Poulakidas said. Andrew Rubin and Michael Rabkin were among the Spartan scorers. GBN skated past Maine Township 3-1 in the semifinals, while the Trevians topped Benet academy 9-2 en route to the finals. Was the High School Classic final a preview of the championship game, come March, for the Illinois High School Hockey state championship? Or will Loyola Gold be skating at the United Center, looking to repeat? And there are many others looking to skate for state at the UC, including Stevenson, Glenbrook South, Saint Viator and St. Ignatius, among others. “We hope we’re there,” Poulakidas said. “New Trier is a really tough, deep team that just never lets up. You have to win against New Trier; they won’t lose the game. David Wilcox and Tim Burke shined for the Spartans in the tournament, as each has all season. Brennan Nein was solid in goal and Charlie Slovis did so many of the little things, such as winning face-offs that often don’t show on a stats sheet. 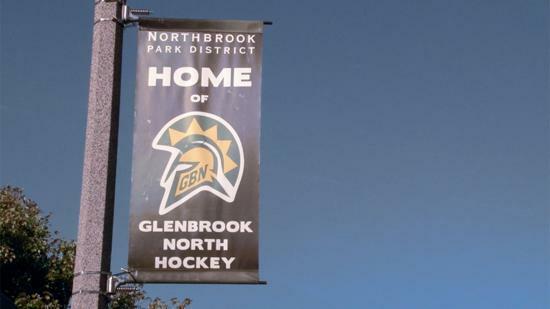 The stage is now set for the GBN-Green rematch on Saturday, Jan. 19 in Northbrook, starting at 4:30 p.m.
Statistics don’t tell the whole story of Glenbrook North senior defenseman David Wilcox, who has 10 goals, 15 assists in his first 26 games this season as the Spartans carried a 21-4-1 record into their Rivalry Night against Glenbrook South on Nov. 21. Wilcox is, without question, one of the main reasons Glenbrook North is a top contender to be skating next March at the United Center. Throw in such talented teammates as Matt Dahlke (20 goals, 8 assists), Casey Miller (11,12), Mikey Day (10, 11) and Brayden Roy (8,13), and this could be a Scholastic League championship team, too. Wilcox is, admittedly, “excited” for the next few months, which includes a Dec. 15 rematch against the Trevians in Northbrook. The Spartans have a solid core of returning skaters, with as much team speed as any. Defense and goaltending is rock solid too, as the Spartans are anchored on goalie Brennan Nein (14-3 record, 1.42 goals-against average). The Spartans have “shown a tremendous amount of improvement so far,” this season, Wilcox said. The Spartans blanked New Trier Blue 5-0 on Oct. 17, then defeated that same Blue team 4-0 on Nov. 15. In between the Blue games, GBN went 8-1 with four shutouts. Wilcox wants to skate at the United Center, period. Willy, as he is known to his teammates, is in his third varsity season. He is a right-handed shooting senior who stands 6-feet tall and weighs 160-pounds. Wilcox, who lives in Northbrook, is still undecided on his college plans for next fall, as he also is considering junior options. Wilcox has long shined in the Spartans’ green and gold, and when representing Illinois in the 2018 America’s Showcase, held last April in the St. Louis area. Wilcox was among 20 selected for the Showcase from 120 of the best high school players in Illinois who were invited to tryout. In addition, Wilcox was picked to the Illinois Fall Showcase team, which played Sept. 20-23 in Blaine, Minnesota. His hockey highlights include playing in the annual GBN/GBS Rivalry Night Game, played the day before Thanksgiving in Glenview, and being named All-State, among other accolades. The Spartans went 4-1 over the Thanksgiving Holiday. In the traditional rivalry game played on Thanksgiving eve the Spartans defeated their sister school Glenbrook South by the score of 5-2. The game was played before a sold-out crowd at Glenview ice Arena. The Spartans got two goals in the 1st period by Casey Miller and Mike Day. Matt Dahlke would add short-handed goal in the 2nd period. South cut the lead to 3-1 with just over 2 minutes to play in the period. The key goal of the night was scored by Charlie Slovis as he answered the South goal just minutes later. Tim Burke would add the 5th and final goal midway thru the 3rd period. 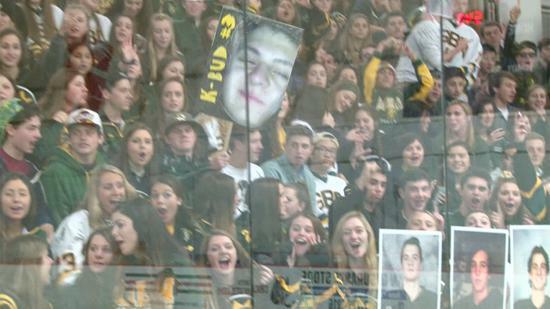 Although the Spartans won going away it was the goaltending of Brennan Nein that kept GBN tied in the 1st period. South had a number of great chances to take the lead but Nein withstood the push and allowed the Spartans to get their legs going. 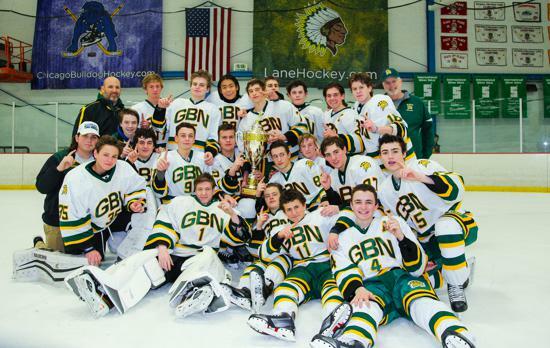 GBN entered Loyola Thanksgiving tournament as the defending Champion. In the first game against Highland Park the Spartans struck early scoring 6 goals in the 1st period, 2 in the first 27 seconds on their way to an 8-0 victory. Game 2 against Barrington was a different story. Leading 2-0 in the 3rd period the Broncos put on a late charge scoring a goal with 5:11 to play making the score 2-1. Matt Dahlke seemed to put the game away with an open net goal at the 1:21 mark but Barrington scored just 13 seconds later to cut the lead to 3-2. The Spartans would eventually close out the game 3-2. Game 3 found the Spartans up against St. Ignatius. Ignatius had stung the Spartans earlier in the year by defeating GBN by the score of 1-0. GBN had a great start to the game as Miller, Dahlke and Slovis each tallied 1st period goals. Ignatius was able to score 1 late in the period. St. Ignatius would make it real interesting as with 6:53 to play in the game they would score a power play goal to make it a one goal game. David Wilcox would score a key power play goal less than a minute later and John Ovnanyan and Mike Day would each add another one making the final 6-2. 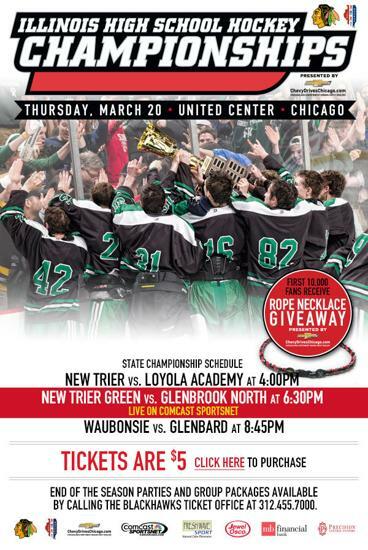 GBN would face their SHL rival New Trier Green in the semi-finals. Green got on the board late in the 1st period to go up 1-0. Then with just over 3 minutes to play Green would strike again to go up by 2. A minute after Greens second goal, GBN’s David Wilcox received a pass from Everette Levin who was positioned behind the New Trier net. Wilcox one timer just above the right circle would deliver the Spartans 1st goal. With 31 seconds to play and New Trier short-handed, GBN pulled its goalie Brennan Nein to add the extra attacker. Charlie Slovis won the draw back to Matt Dahlke and Dahlke’s wrist shot found the back of New Triers net and just like that the teams were headed to overtime. With just over 40 seconds to play in the 1st OT, GBN had a great chance to win the game when a rebound came out to an attacking GBN player who had an open net but the puck jumped over the stick and play continued. Green would win the game just seconds later as a strange bounce off the end boards found a Green player standing at the left face off circle and the shot would go over the blocker of Brennan Nein ending the hopes of another O'Grady Cup for the Spartans. New Trier would go on to beat Loyola in the championship game by the score of 3-1. GBN met York Saturday in an SHL contest. The Spartans would come from behind twice to prevail 4-3. York jumped out to a 2-goal lead. York’s Quinn Haller took a face off in the Spartans zone, he pushed the puck forward and let go a shot that was originally stopped by Brennan Nein but his follow up ended up in the net. York would strike again on a shorthanded goal with just under 11 minutes to play in the 2nd period. The Spartans would answer back before the period was over. David Wilcox would score a power play goal at the 4-minute mark then Evan Izenstark would tie the game with seconds to play in the period as he rushed the puck and went down the left side of the ice and let go a shot that found its way under York’s Tom Wesolowski. York came out in the 3rd period and scored on their first shift of the period to go up 3-2. Less than a minute later Andrew Rubin responded for the Spartans to tie the game. The winner came with just over 6 minutes to play as John Ovnanyan would rip a shot that hit under the cross bar and in. Sunday’s game was the Matt Dahlke show as Dahlke would net 4 of the 6 goals scored by the Spartans as they defeated St. Rita by a 6-0 score. Dahlke would score 2 power play goal and then add 2 short-handed goals for a day that he will always remember. Tim Burke and Daniel Wilcox would each add one. Sam Billis in goal for the Spartans recorded the shutout. The win against Rita was the 20th of the season for Spartans. 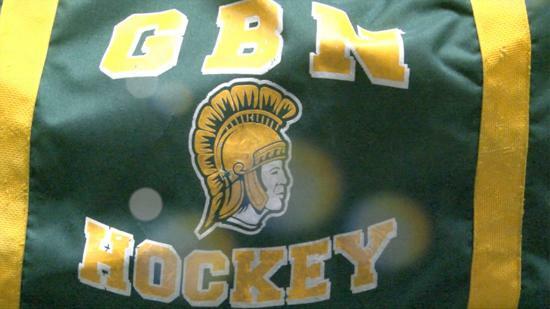 GBN is now 20-4-1, 5-1 in the SHL. On a night when the Spartans were not that special their special teams and goaltending were. 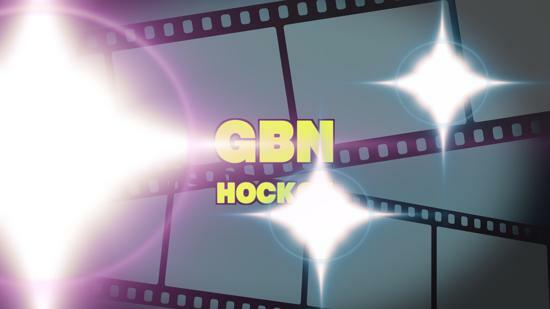 GBN Defenseman Evan Izenstark provided just enough offense, and Goalie Brennan Nein provided the defense in a 3-1 win against Barrington Wednesday night in Crystal Lake. The Spartans took a 1-0 lead with just under 6 minutes to play in the 1st period on a shorthanded goal by Charlie Slovis. Barrington still on the same power play would tie the game when a rebound came out to Shane McCloskey who poked it past Nein. The play of the game was made by Izenstark. With less than 15 seconds to go in the period. Izenstark took the puck deep in the Spartans zone and went end to end. He cut to his right after entering the Broncos zone and let go a hard shot from 30 feet that found its mark with 9 seconds to play in the period. GBN would add a powerplay goal in the 3rd period when Izenstark blasted home a shot from he left point giving the Spartans their 3rd goal. GBN was uncustomarily sloppy in its own zone and elsewhere leading to numerous odd man breaks for the Broncos. Spartan netminder Brennan Nein made several key stops, none bigger when he stopped a break away while the Spartans had a 2-man advantage. 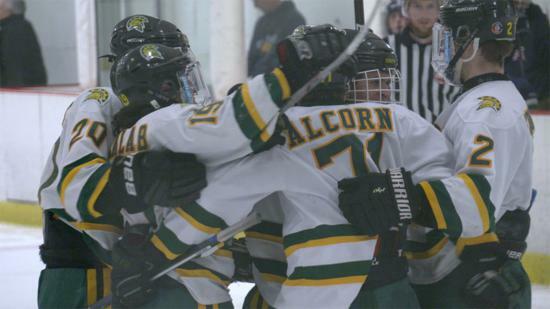 Glenbrook North captain David Wilcox and alternate captain Michael Day have played hockey since they were 3 and became teammates when they were 6. In fact, most of the current Spartans have been teammates for a decade already. “A lot of us have been together since then,” Wilcox said. That familiarity has helped create the team culture that has made Glenbrook North a state championship contender each and every season. The chemistry showed during a 4-3 loss to undefeated New Trier Green on Sunday in Northbrook. Day, a senior forward, scored in the opening minute on an assist from Wilcox. The Spartans (17-4-1) led until midway through the second period, when New Trier (20-0) forged a 2-2 tie. Glenbrook North regained the lead 14 seconds later when Day notched his second goal of the night on an assist from Tim Burke. Day said the drive that led to a quick go-ahead goal is an example of how the Spartans respond under pressure. And that kind of poise is a result of years of playing together. Though they did not know each other when they were toddlers, Wilcox and Day started playing hockey at the same time. For Day, hockey is a family affair. He said his father and three older brothers played before him. “It seemed like we were always on the ice,” Day said. 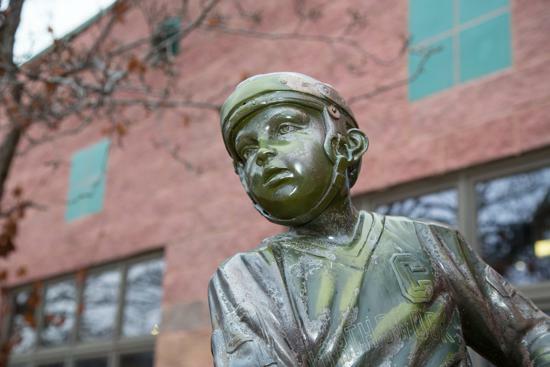 By the time they were 6, Wilcox said he, Day and other members of the current Spartan varsity were playing together on youth hockey teams in Northbrook. There, they forged the bonds that helped them reach the Amateur Hockey Association of Illinois state semifinals last season. Another ingredient for the Spartans is leadership. Coach Evan Poulakidas said Wilcox is the best player in the state and added that he has earned his spot as the team’s captain. Poulakidas said Day led by example against the Trevians. He played with an injured right shoulder but still scored two of the Spartans’ three goals. Casey Miller scored an unassisted goal that gave the Spartans an early 2-0 lead. New Trier tied the game 3-3 on a two-man advantage after the Spartans were penalized twice in a row. The Trevians took the lead with 10:42 remaining. Despite the loss to the undefeated Trevians, Day said the team’s chemistry and culture will help during the rest of the season. The Spartans are aiming for a playoff run that stretches into March. The Spartans played 3 games in 3 days and came away with a 2-1 record. In back to back games Friday and Saturday the Spartans defeated Culver Military Academy by the scores of 6-0 and 4-3. John Ovnanyan led the scoring in game one with two goals and the Spartan defense gave up very little to the Eagles offense, 10 shots in total while the Spartans piled up 35 shots. Game two with Culver was a close contest. Culver would hold a 1-0 and 2-1 lead before the Spartans behind a terrific performance by Matt Dahlke caught and passed the Eagles. Dahlke tied the score at 1 on a power play goal in the 2nd period. Then on a spectacular individual effort scored on a short handed situation at the end of the 2nd period to give the lead back to the Spartans 3-2. With just under 12 minutes to play, Dahlke would take a 60 foot slap shot for the game winner. In the SHL game of the week, the Spartans met the undefeated New Trier Green in a battle for 1st place in the league. Green would remain undefeated eclipsing the Spartans by the score of 4-3. 25 seconds into the game GBN's Mike Day scored on a rebound shot from David Wilcox. 3 minutes later Spartan Casey Miller would score an unassisted goal giving the Spartans a quick 2-0 lead. With less than 2 minutes to go in period 1, a Spartan turnover on the left side of the net turned into the first goal for the New Trier. Green would tie the game early in the second period but GBN answered 14 seconds later when Mike Day was sprung on a break away by Tim Burke and Day made no mistake giving the lead back to the Spartans at the end of two periods 3-2. The game changed in the 3rd period when GBN took an offensive zone penalty followed by a tripping penalty while killing the first penalty. Green wasted little time with the two man advantage as Gavin Randle tied the game for New Trier. With under 11 minutes to play, a innocent looking shot from the point found it's way past a screened GBN goalie Brennan Nein for the final tally. It's hard to lose games when you your team gives up zero goals in two games, and that is exactly what the Spartans did in defeating Barrington Saturday night 2-0, and then on Sunday defeating Saint Viator 4-0. Sam Billis recorded the shut out against Barrington, while Charlie Slovis netted two goals. Billis stopped all 16 shots and the Spartans rang up 51 shots for the game. In a physical contest at Saint Viator, Matt Dahlke scored a hat trick with two of his goals coming on the power play and Mike Day added one in the victory. Brennan Nein earned the shut out stopping all 21 Lions shots. The defense was superb in both contest limiting high scoring chances and creating offense in transition. GBN is now 3-0 in SHL play and 15-3-1 overall. This week Culver Academy will travel to Northbrook for games Friday and Saturday, and then a showdown with New Trier Green awaits the Spartans on Sunday. Casey Miller scored twice in similar fashion as the Spartans defeated SHL foe Stevenson 2-1 Wednesday night in Northbrook. Goalie Brennan Nein stopped 22 of 23 Patriots shots to back stop the win. The game was scoreless in early in the s 2nd period when a Braden Roy took a shot off of a face off, Roy's shot was partially blocked and Miller found the loose puck and taped in the shot that went under the pad of Patriots goalie Jeremy Ribak for a 1-0 lead. The Patriots tied the game late in the 2nd period when Daniel Romm let go a 42 foot wrist shot that hit the far right post and went in. With less than 7 minutes Miller again found a puck right off a faceoff and let go a shot on the ice that again beat Patriot goalie Jeremy Ribak for the winner. The win pushed the Spartans to 2-0 in the SHL and 12-3-2 overall. GBN will play Barrington Sat. in Northbrook and Saint Viator Sunday in Mt. Prospect. The North American Hockey League has invited a high school team from Illinois to participate in an upcoming showcase starting Sept. 20th thru the 23rd in Minneapolis, MN. 20 top players from Illinois were selected. 4 Glenbrook North players have made that team. They are Goalie Brennan Nein, Defenseman David Wilcox and Tim Burke and Forward Mike Day. Congratulations to these players and best of luck at the showcase. There are plenty of opportunities for our HS players to get involved in refereeing. You can start by clicking the link below to find out information about seminar schedules and the process. All High School players are required to complete a baseline test prior to September 1, 2018. Please keep your receipt/proof of the baseline test as you will be required to send a copy to the team manager. A Step aHead Registration Now Open! 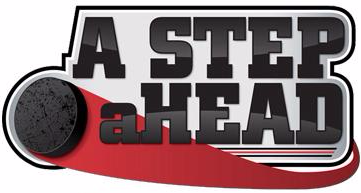 AHAI is excited to announce the 8th Year of the A Step aHead Program in conjunction with the Chicago Blackhawks, Athletico Physical Therapy and NorthShore University HeathSystem. The goal of the A Step aHead Program is to educate the youth hockey community on concussion awareness, prevention and treatment as well as to provide FREE baseline neurocognitive testing to AHAI members. A Step aHead testing is available for AHAI members ages 11-18 (12U through 18U/High School). Click HERE to learn more about the A Step aHead Program and to REGISTER NOW! Congratulations to the following GBN Hockey players for being named to the All Academic SHL team. GBN VARSITY WINS HOOSIER CUP! South Bend Indiana-Glenbrook North celebrated it's 50th win of the season by taking home the championship trophy of the Hosier Cup. GBN defeated Cathedral Catholic 3-1, Wyzatta of MN 5-1 and Dayton 5-1 in the divisional play. The semi-final game was against Culver Academy. Twice the Spartans trailed but fought back to tie the game. Jacob Crane's 2nd period power play goal with no seconds to play was the most dramatic goal and gave the Spartans a tie going into the 3rd period. Crane would then get the winner with 12:05 to play when he tipped in a Tim Burke shot from the point, the goal was another power play goal. The finals featured DeMatha Catholic of Maryland. The Spartans again relied heavily on their power play. Jacob Crane opened the scoring in the second period when he scored a power play goal and David Rubin followed Crane's lead with a second power play goal with just over 6 minutes to play giving the Spartans a 2-0 lead. A minute later DeMatha scored their one and only goal with just over 5 minutes to play. DeMatha had some good looks at the end of the game in part because the Spartans took some bad penalties and were forced to kill a 5-3 which they did to secure the Championship. David Rubin was named the MVP of the tournament. Glenbrook North came away with one of the premiere tournament championships by winning the Loyola Thanksgiving Classic by defeating St. Viator in the finals 3-2 in overtime. North gained access to the semi-finals by defeating Barrington 5-2, St. Igantious 3-1 and Highland Park 4-0. In the Semi-finals against the number 1 team in the state Loyola Gold GBN got a power play goal from Mike Day as he tipped in a shot from defenseman Tim Burke early in the 2nd period. From there, Spartan goalie Tyler Laarveld put on quite a show kicking out all 50 shots of which many of the saves were of the spectacular fashion. In the finals St. Viator jumped out to a 2-0 lead in the 1st period. The first goal coming off a penalty shot and the second goal just minutes later. The 2-0 held until David Rubin with just under 12 minutes to play scored on a wrist shot from the right side of the ice, the goal was assisted by Mike Day. Goalie Brennan Nein gave the Spartans a chance to win when he stopped a breakaway with 8 Minutes to play keeping the score 2-1. With less than 5 minutes to go, GBN capitalized on a 5-3 advantage when Tim Burke put home a shot from the top of the left circle. Both teams had some chances in the extra period but it was Matt Dahlke who found a loose puck 20 feet out in the middle of the ice, he spun around and let go a low shot that found the left side of the net for the clincher. The win pushed the Spartan record to 32-5-3 for the season. GBN went 3-1 in the Central States Showdown last weekend. Playing against the top club teams the Spartans only defeat came in game 1 against the Leafs by the score of 4-2. The game was tied 2-2 in the 3rd period when off a face off the Leafs were able to grab lose puck and score the go ahead goal. The Spartans in attempt to tie the game gave up an open net goal. Game 2 saw the Spartans defeat the Chicago Hawks 3-0. GBN efforts was solid all game long. Game 3 had the Spartans defeating Littleton of Colorado by the score of 7-1. Seven different Spartans tallied in the game. Game 4 defeated the Northwest Chargers 6-2 in a very physical affair. The Spartans then traveled on Thursday night to play St. Rita in a non-SHL game. The Spartans took leads of 1-0 and 2-1 before falling behind 3-2 late in the 3rd period. A short handed goal by the Captain David Rubin late in the game salvaged the tie on a night that the Spartans were not at their best. 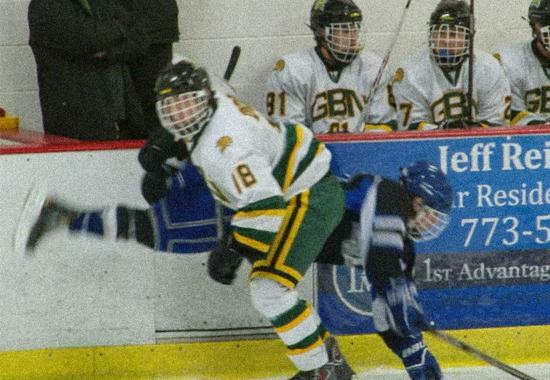 GBN opens up the SHL season this Sunday against Fenwick. In back to back games Saturday and Sunday, GBN defeated Saint Viator by identical scores of 2-1. The two wins pushed the Spartans record to 9-0. Both games were similar with GBN jumping out to a 2 goal lead. In Saturdays game Viator scored late and pushed hard to tie by Tyler Laarveld made a number of key saves to secure the win. Saturdays game found Viator cutting the lead to 1 in the 2nd period and then seeing the 3rd period scoreless. The best chance the Lions had to tie was when GBN goalie Brennan Nein made one outstanding save and then another as he blocked the shot with his face. The Spartans are set to play in the Central States Showcase this weekend. The Spartans continued their winning ways by defeating Nortre Dame of Niles by the score of 6-0. Mike Day and Max Povorozniouk both scored 2 goals in the 4 goal 2nd period. Spartans John Ovnanyan and Brayden Roy finished the scoring in the 3rd period. Goalie Brennan Nein recorded the shutout by making all 17 saves. The Varsity captured the Wheaton Pre-Season tournament with a 2-1 win over fellow SHL member York 2-1. But the game of the day occurred earlier when GBN faced off against sister school Glenbrook South in the semi-finals. South held a 4-0 lead go into the 3rd period then the David Rubin show began. Rubin got the Spartans on the board at the 2 minute mark of the 3rd period and then again with 11 minutes to play cutting South's lead in half at 4-2. South's forward Ben Thomas scored with 5 minutes to play giving South another 3 goal lead. Rubin then really went to work as he scored with 3:49 to play, 3:21 and :55 seconds. The Spartans then completed the comeback in Ot as Mike Day found a lose puck just 39 seconds into the extra period to put the Spartans into the championship. In the final against York, GBN took a 2-0 lead into the 3rd from goals from Rubin 5 minutes apart in the second period. From there the goaltending of Tyler Laarveld and a solid defensive effort closed out the game. The GBN JV got off to a fast start in 2017-18 capturing the Pow Wow tournament at All Seasons Ice Rink this past weekend. In the 4 division tournament the Spartans won their bracket by defeating AWF 5-0, Highland Park 3-0, Oak Park River Forest 2-1. 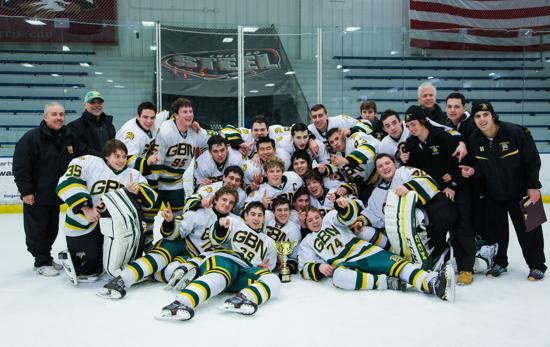 In the Semi-Finals GBN outscored Benet 7-4 and then defeated Wheaton in the championship 6-2. Spartan forward Alex Adler was named the Most Valuable Player. Coach Jeff Marks liked what he saw citing his defense and goaltending were strong all weekend and he liked the way his forwards moved the puck. "It's a good start but we can get even better" said Marks. The Spartans move to the sem-finals of the Wheaton High School pre-season tournament with wins over Nequa Valley, St. Rita and Buffalo Grove. The Spartans have score 23 goals in the 3 games while only surrendering 5. Jacob Crane had a 4 goal game against Nequa and Michael Day had 4 goals against Buffalo Grove. The semi game will be played at 11 am at Centre Ice in Glendale. GBN played the annual opening game at Providence on Labor Weekend Sunday and came away with a come from behind win 5-3. The game was at Southwest Ice Arena in Crestwood. Senior David Rubin led the Spartan attack with 3 goals. His first one of the game put the Spartans in front early in the 2nd period 1-0. Late in the 2nd period the Spartans were shorthanded when Rubin won a faceoff back to defenseman Evan Izenstark and Izenstark blasted a 65 foot slap shot past the Celtics goalie Jack Pavlis to tie the game at 2. Providence took the lead in the 3rd period when Jack McConnell came in all alone on Brennan Nein and slid the puck past the outstretched goalie, the goal came with 11 minutes to play. Jacob Crane got the Spartans even at 3-3 with 5:43 left to play, with an assist from Tim Burke and Zach Walden and then Rubin delivered the final two blows at 5:05 and 17 seconds . The Spartans travel to Center Ice this weekend for an Early Bird Tournament. JV and Varsity teams are now posted. Please go to the "Teams" tab on the left side tab to view teams. We would like to take this opportunity to share with our hockey families that Rich Blakey will be stepping down from the GBN Junior Varsity Head Coach position. Rich will be dedicating more of his time to player skill development for our Jr. Spartans and Bluehawks players. A big heartfelt THANK YOU to Rich for all his time and dedication over the years to the GBN Hockey Program! He played a major role in the success of the program and we cannot thank him enough for his coaching, concern, time and service to our players and families! We are thrilled to announce that Jeff Marks has accepted the GBN Junior Varsity Head Coach position. Jeff has been coaching for the Northbrook Hockey League for both the Bluehawks and GBN for over a decade. He has served in the role of Assistant GBN Junior Varsity Coach for the past two years. Jeff brings a wealth of experience and expertise to the coaching position and we are excited for the future! BRING ON THE BANNERS JEFF! Congratulations to the JV team for their sweep of Loyola in the SHL Championship! The Chicago Blackhawks, AHAI, Athletico Physical Therapy and NorthShore University Health System are proud to announce the 6th year of our "A Step aHead" program! The goal of our program is to educate the youth hockey community on concussion awareness, prevention and treatment as well as to provide FREE baseline neurocognitive testing to AHAI members. A Step aHead testing is available for AHAI members from PeeWee to Midget/High School (ages 11-18). Additional information is available on the AHAI, AHAIeNews and Athletico Physical Therapy websites. Registration is NOW OPEN; testing is available through November 30, 2016. This year's program will also offer new educational opportunities for both Moms and Dads, Coaches and Players. Stay tuned for additional information. All NBHL players are required to take a baseline test; complimentary through the A Step aHead program. Click on the logo to launch the registration site. GBN JV wins the 2016 Scholastic Cup; defeats New Trier 4-1 to win the series final in two games. New Trier scored first, but GBN responded with 4 unanswered goals to defeat New Trier and win the 2016 SHL Scholastic Cup in regulation. Congratulations GBN JV! as a Blackhawk Alumni Scholarship Award Winner!! This is one of the highest honors that a Illinois High School hockey player can receive. GOALIES: Will Douthit NTG, Marcus Kunzmann Barr. FORWARDS: Joe Day GBN, Ryan Hill LAG, Michael Gonzalez LAG, Charlie Burton NTG, Ty Habedank RFD. DEFENSE: Gary Barbera Barr, Zach Knudson GBN, Daniel Levey STV. 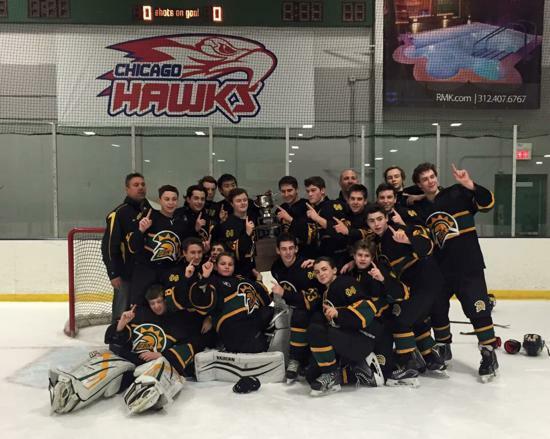 GBN JV defeated New Trier 5-4 to win the 2015 Chicago Scholastic Showcase by scoring three goals in the third period. The Spartans entered the semi-finals with a 2-0-1 record by tying Brother Rice and defeating Fenwick and Benet. Taking on Fenwick in the semis, GBN defeated Fenwick 3-1 to take on New Trier. Congratulations to the GBN JV Spartans! The 2015 Alumni game will be December 19th. We hope to have two games featuring both younger alumni and more experienced alumni. The Alumni games will be followed by the GBN Varsity vs New Tier Green. Should be a great day for GBN Hockey! Mark your calendars. Initial rosters for the upcoming season are posted below. Please note that throughout the season players may move up or down according to coaches evaluations. Please check calendar for practice times. Click on Image to Watch Highlights of GBN Varsity's State Championship Win! Behind a stingy defense and opportunistic offense, the Spartans were able to move onto the SHL Finals with a 2 games 0 sweep of Rockford. In the first game played on Friday (2/18), GBN took advantage of a two man advantage in the first period and scored two goals, both by defenseman Chad Yale, to take a quick 2-0 lead. Logan Nein would put the Spartans up 3 when he scored midway through the third period on a rebound shot. Rockford broke Garrett Cohen's shutout bid with just a minute to play, to make the final 3-1 in game 1. In game two at Rockford, the line of Kyle Fisher, Tyler Mulier and Eric Doar, got GBN on the board first when Doar captured a rebound and put it under Rockford goalie Brandon Roderick. On a 4 on 4 situation, Rockford would tie the score in the second period when the Spartans turned the puck over deep in their own zone, a scramble occurred and the Iceman would jump on a loose puck and tie the game. Alex Merritt answered right back just a minute later to put the Spartans up 2-1 on a tap in goal. This goal seemed to stem any momentum that Rockford had gained after their first goal. GBN would extend their lead in the 3rd period when Mulier attacked the Rockford net on a 2 on 1 and choose to shoot the puck, his first shot was saved but he stayed with the play and scored on the rebound. The Spartans would add two more late goals to make the final 5-1. 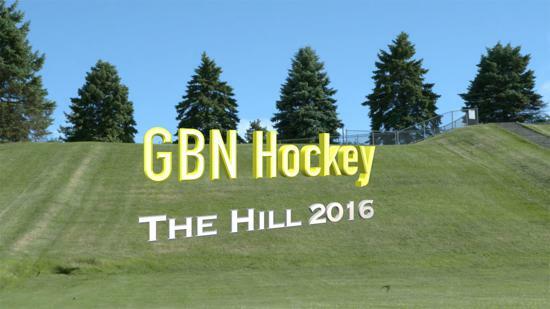 It is the third straight year that GBN will play in the SHL finals and a chance to defend their existing title. Congratulations to Coach Evan For Being Selected as SHL's Co-Coach of the Year!!! GBN defeated Stevenson in game 2 of the best of 3 series by the score of 4-3. The win moves the Spartans to the Semi-finals of the SHL where they will face Rockford. The Spartans fell behind at the 11 minute mark when Jordan Marcelleti scored a power play goal. Jake Rabin would tie the game when his shot from the left point beat Stevenson goalie Aryel Furman. Spartan Chris Zhang would put GBN ahead when he made an incredible move to get around the Stevenson defenseman then find the upper part of the net on Furman. Although the Spartans ended the period with a 2-1 lead, the real story was Stevenson’s goalie Aryel Furman who made at least 5 point blank saves to keep the game close. Stevenson would jump ahead as Marcelleti would score another power play goal. Patriot Luke Favia would find space between both Spartan defensemen and accepted a long stretch pass and went in all alone on goalie Garrett Cohen where he rifled a slap shot past him giving Stevenson a 3-2 lead heading into the 3rd period. Defenseman Chad Yale would tie the game with a 35 foot slap shot that escaped Furman midway through the period. With less than 6 minutes to play, Chris Merritt received a pass from Jake Rabin starting a 2 on 0 with Logan Nein. Merritt"s soft pass gave Nein the right side of the net and he buried his shot giving the Spartans the game and series. The Spartans opened the SHL best of three playoff series with Stevenson, with a 6-3 win. Pacing the Spartans offensive attack was Alex Merritt, with four goals.GBN wasted no time scoring, Chris Zhang would score on the very first shot, 13 seconds into the game, giving the Spartans a quick 1-0 lead. 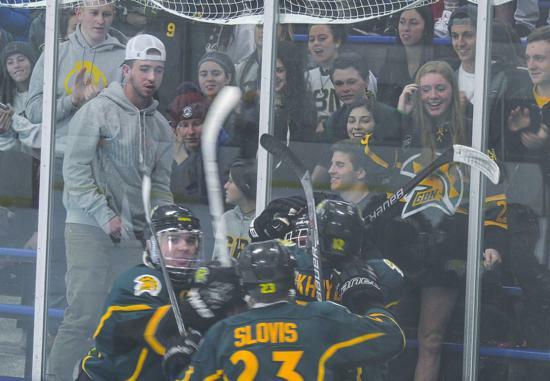 Kevin Zajac answered for Stevenson when he beat GBN goalie Garrett Cohen, two minutes later. Merritt would score the first of his 4 goals on a power play half way through the first period. 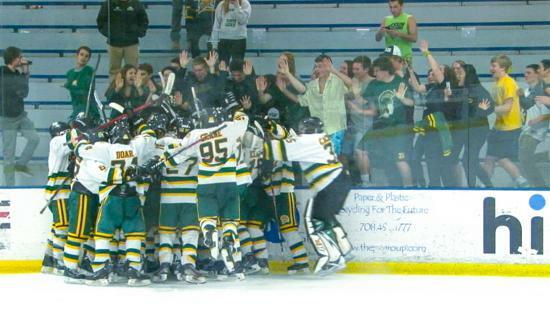 Stevenson would again tie the score as they benefited from a 2-man advantage and scored a power play goal of their own. Merritt's second goal would again be on the power play two minutes into the second period. This time the Spartans would never surrender the lead by scoring the next four goals and staking themselves to a 6-2 lead.Stevenson would add a late goal for the final 6-3. Shots for the game were 39-16. Game 2 is Thursday night, 8:30 p.m., at Twin Rinks, Buffalo Grove. Congratulations to the Following GBN Players Who Made the SHL All-Academic Team. To Be Eligible, Players Must Have an All Academic Cumulative GPA of 3.5 or Higher. GBN finished off their regular season by going 1-2. The Spartans defeated Stevenson by the score of 6-2. The game was closer than the score indicates as the game went into the third period with the score: GBN 3 Stevenson 2. Three third period goals by the Spartans put the game out of reach and set up a showdown with New Trier Green with 1st place at stake on Tuesday. Green in a tight checking game would defeat the Spartans by the score of 2-0, with a second and third period goal. The win gave the Trevian’s the Coaches Trophy, emblematic of the SHL regular season champion and top seed in the SHL playoffs. The Spartans had won this title last year. In the final game against Loyola Gold, Joey Day put the Spartans ahead when he connected on a one timer to beat LAG goalie Nick Bolino. Loyola would score two third period goals to jump ahead of the Spartans but Chris Zhang would tie the game on a power play goal half way through the period. The game remained tied and went into the shoot out where Gold’s first two shooters would score and Bolino closed the door on each of the Spartan shooters giving Gold the win 3-2. The win pushed Loyola to 3rd place, the Spartans finished in 2nd place. GBN will host Stevenson Saturday night at 8 pm in Round 1 Game 1 of the best of three quarter finals. Congratulations to all-state selections: Alexander Merritt, Chris Zhang and Kyle Slovis. Come watch them play on Monday, February 9th, at the Edge in Bensenville. The Spartans rolled off another 3 wins in a row this past week with each game having its own dramatic finish. 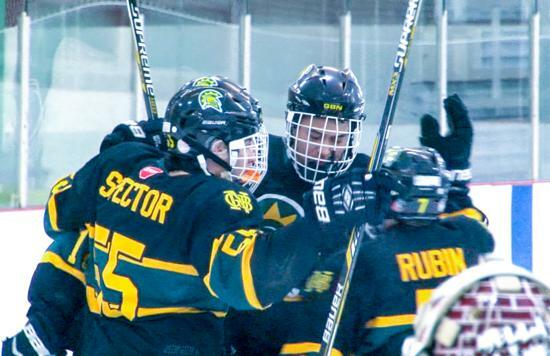 GBN played the Northwest Chargers in a non-SHL game and seemed to be breezing along, as Alex Merritt scored a natural hat trick in the 1st period and Jake Rabin would add a 3rd period goal staking the Spartans to a comfortable 4-0 lead. But the Chargers would score midway through the 3rd period and then score 2 late period goals causing the Spartans to have to hold on to win. Saturday night GBS came to Northbrook in an SHL game. GBS took no time in scoring as on the first shift of the game they would find the back of the Spartan net. From there, GBS goalie Matt Grinde would become a human wall, as everything the Spartans would throw at him was stopped. Finally, with eight minutes to play, Chris Zhang would score a power play goal. Three minutes later Kyle Slovis would score on a delayed penalty giving GBN a tough 2-1 victory. On Sunday, GBN would take on New Trier Green. Green had suffered a loss at Rockford on Friday night allowing the Spartans to sneak closer to first place just 4 points out. Could this game match the intensity and drama of the first two? NTG had won the previous two. The first one in a shootout and the second game played for the Culver Cup Championship with a very late goal. The game did not disappoint, Green started fast and scored the 1st goal of the game on a defensive turnover by GBN. Had it not been for Spartan goalie Garrett Cohen, the game might have gotten away in the first period as he made numerous big saves. GBN found itself in the 2nd period and with 9:56 to play Jared Epstein would score from in tight just after a Green penalty had expired. Epstein would put the Spartans up 1 when he found a loose puck about twenty feet out and put it under Green’s goalie Jack Junge. Green would tie the game late in the period as Colin McBride shot went off a Spartan skate and past Cohen.The two teams traded chances and checks in the 3rd period with neither team able to score. Spartan Chris Zhang would score as the second GBN shooter on a terrific back hand move. From there ,Spartan Goalie Garrett Cohen would take over and stop all three Green shooters.The win now puts GBN just two points behind Green in the SHL standings. The Spartans ended a grueling week of SHL play by playing 5 games in 6 nights and the outcome could not have gone any better as the Spartans would win all 5. The week started off with a 10-1 win over Saint Viator on Tuesday night. Chris Zhang had a hat trick and Tyler Mulier and Kyle Slovis each had two goals. The Spartans then traveled to Loyola Gold on Thursday. The Spartans stifled the Ramblers by only allowing 11 shots for the game on their way to a 4-1 win. Zhang scored two more goals and Chad Yale and Jake Rabin each had one. Garrett Cohen although not tested often, came up with a couple of big saves to keep Gold at bay. Friday night GBN took on Rockford to try to avenge the 2-1 shootout loss the last time the two teams met. The Spartans came out flying by scoring 5, first period goals on their way to a 6-0 blanking of the Icemen. Saturday night’s game was secondary to the annual Senior night. The class of 16 seniors were honored along with 2 Spartans Skaters. The game featured the Broncos of Barrington High School. The last time the two teams met was for the Loyola Gold Thanksgiving tournament which the Spartans won in overtime. The Seniors would not be denied on this night as GBN would win 7-1. Defenseman Chad Yale would gather 5 points 3 goals and 2 assists and Tyler Mulier would chip in two goals. Sunday night game at Fenwick would close the week out and the Spartans ended it on a high note with an 11-2 win. 8 different players would score for GBN. The win was the team's 50th of the year. During this week, the Spartans outscored their opponents by 38-5. It was also the 11th straight win in a row. 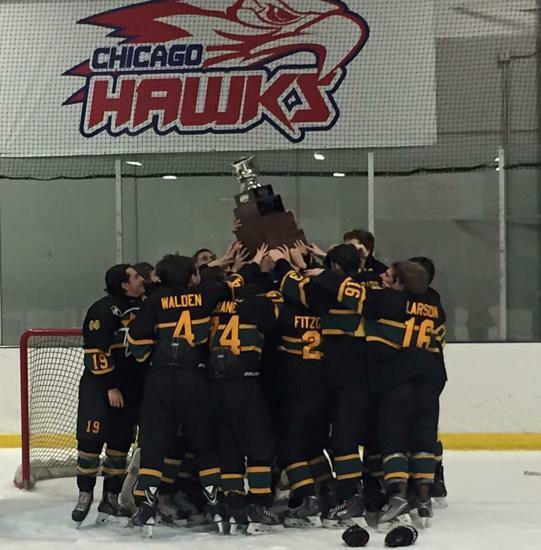 For the second time in 3 years, the Glenbrook North Spartans were crowned champions of the prestigious Blackhawk Charity Tournament played at the Edge ice rink. The Spartans who have appeared in the finals the last 3 years defeated New Trier Blue in the finals with a 2 to 1 win. Both Blue and the Spartans came from the same bracket in the Mikita Division. The Spartans advanced by being the first seed and New Trier the second seed. In the preliminary round GBN defeated New Trier Blue 6-3, Notre Dame 3-1 and Waubansie 8-0. In the quarterfinals, the Spartans with a 6-goal performance by Alex Merritt, defeated Lake Forest 10-0. 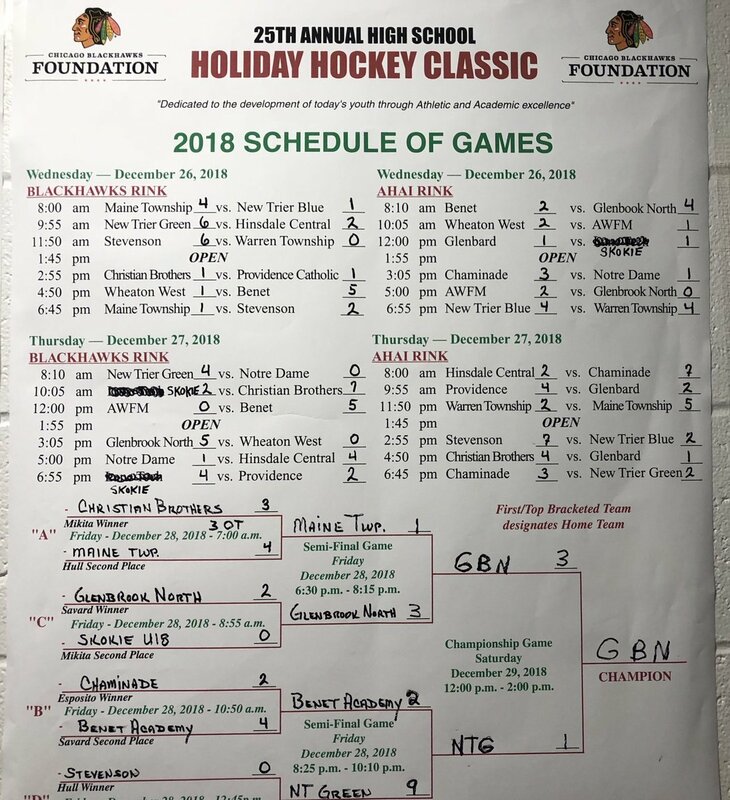 In the semi-finals, GBN played a tight game with Naperville Central and with 25 seconds left in the game, it was Alex Merritt that finally broke the tie with a backhand shot that eluded the Central goaltender to vault the Spartans to the championship game. In the finals, Eric Doar opened the scoring in a tight checking game when a misplayed puck from behind the Blue net came to the front of the net where Doar tapped it in to put the Spartans up. Jared Epstein scored minutes later when his shot from the left side of the ice found its mark putting the Spartans up 2-1. Blue fought back and with 10 minutes left, GBN's Garrett Cohen finally was beaten from about 30 feet out on a high wrist shot. Cohen and the Spartan defense would not let anything else up and would go on to win 2-1. The win pushes the Spartan overall record to 45-7-2-2. The Spartans have now won two major Championships this year, the Loyola Gold Thanksgiving and the Blackhawk Charity. Click on Image To Watch GBN Varsity's "Peace on Ice"
Two Illinois teams played for The Culver Military Academy’s Annual Cornfield Cup, New Trier Green and Glenbrook North. In an epic game, New Trier Green defeated Glenbrook North by the score of 5-4. The 8 team field included Shattuck Saint Mary’s, St. Ignatius of Ohio, Carmel of Indiana, host Culver Academy, Gilmore Academy and Walsh Jesuit of Ohio. New Trier arrived at the Champions by defeating Gilmore, Walsh and Culver. 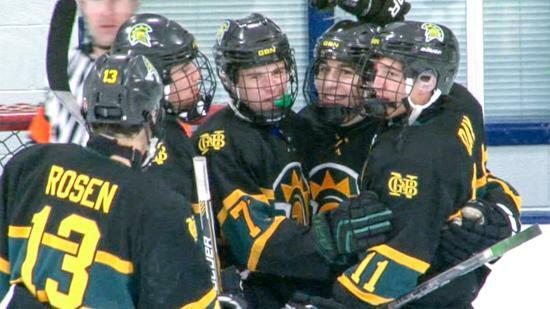 While Glenbrook North defeated Shattuck, St. Ignatius and Carmel. In the Championship game, New Trier scored two 1st period goals. Brent Segvich put in a rebound goal at the 13 minute mark and Cooper Johnson scored from the left point on a power play to close the scoring in the 1st. GBN cut the lead in half just a minute into the 2nd period when Spartan Chris Zhang while on a power play poked home a rebound to make the score 2-1. Green countered the Spartan goal at the 5 minute mark. While on a 5-3, Trevian Graham Soman extended the Green lead back to two when he blasted a shot from just outside the right faceoff circle that Cohen had no chance with. 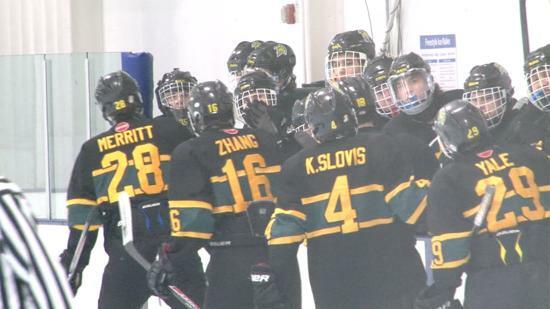 Glenbrook North Chris Zhang scored a terrific individual goal when killing the back half of the 5-3 penalty he found a loose puck at red line and with a defenseman draped all over still found a way to beat Green goalie Jack Junge just 30 seconds after the Green’s goal. Spartan Chad Yale would tie the game with 2 minutes remaining in the 2nd period when his shot from the right point found the back of the Green net. The 3rd period was filled with up and down action and with the score tied at 3, Spartan Alex Merritt gave GBN their first and only lead of the game when he came in from the right side of the ice and his back hand shot flew over the shoulder of Junge with 4 minutes into the period. Green’s Colin McBride tied the game at the 10 minute mark when he out battled a GBN defender in front of Cohen and lifted a back hand shot into the net. With overtime looming Green’s Colin McBride attacked the middle of ice entered the Spartan zone where he was checked off the puck by a number of Spartans but the puck laid loose about 40 feet from the Spartan net where Matthew Kenyon picked it up at. Kenyon took a number of strides waited and roofed a shot that hit right under the cross bar and into the net for the winner with 18 seconds left to play. The Spartans took on rival Loyola Gold in an SHL game Wednesday and defeated the Ramblers 2-0. The first period was scoreless but the Spartans generated plenty of scoring chances with 17 shots. A three way passing play between Chris Zhang, Logan Nein and eventually Alex Merritt, led to the first goal of the game as Merritt finished the play coming down the left side of the ice and beating LAG goalie Devin O’Brien. The rest of the period was scoreless with the Spartans outshooting Gold 11-3. Alex Merritt would set up Zhang for the second goal just seconds into the third period. Merritt picked off a clearing pass at the Gold blueline and found Zhang all alone with O’Brien. Zhang made one fake to his left and went to his right where O’Brien got a piece of the shot but not enough of it to stop it from going in. Gold had its best period of the night in the third but Spartan goalie, Brett Zera stopped all 10 of the Ramblers shots and his way to the victory and his 5th shutout of the season. For the game the Spartans outshot Gold 33-16. The Spartans head to Culver Academy for a weekend tournament starting Friday night. 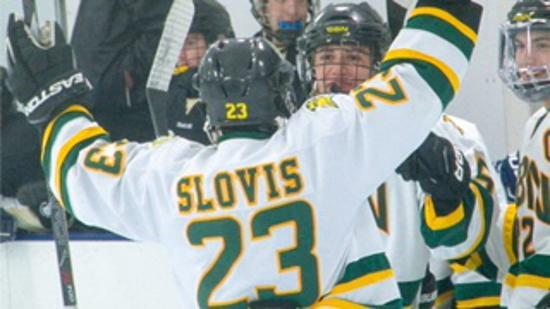 Glenbrook North won its 7th straight game Sunday night by defeating Stevenson by the score of 4-1 in an SHL contest. The win pushed the Spartan record to 33-5-2-2. Jared Epstein, coming off the overtime game winner against Barrington in the Loyola Thanksgiving tournament, remained hot by scoring two goals. Early in the first period, Epstein deflected a shot taken by Jake Rabin that beat Stevenson net minder Jacob Shellist. With one second to play in the second period, Epstein let go with a high wrist shot that hit right under the crossbar and went in for the fourth Spartan goal of the game. Alex Merritt and Chris Zhang teamed up for the second goal when Merritt drove the right side of the net and found Zhang on the back door and then Zhang released quickly to beat Shellist. Logan Nein added the third goal in the seconnd period when he came off the left board around the faceoff circle and drilled a 22 foot shot. Alex Cacioppo made 24 saves and earned the win. For the game, GBN outshot Stevenson 38-25. Registration for the 2014 GBN Alumni game is now open. The date of the game is December 20th. Please go to the Registration page and click on the link to register. The Spartans had much to be thankful for during the Thanksgiving Holiday. In the traditional rivalry game between Glenbrook South, the Spartans came away with a 6-2 victory in front of a sold out crowd in Glenview. Zach Knudson opened the scoring when his shot from the left point beat Titan goalie Matt Grinde and Spartans never looked back. Chris Zhang was magical, scoring 3 goals, 2 of which were on the power play. GBN spent the weekend by playing in the 43rd Loyola Gold Thanksgiving tournament. The Spartans had played in the finals the past two seasons and this year would be no different. In the first game against Highland Park, GBN spotted the Giants a 2-0 lead until late in the 1st period when Joe Day scored on a wraparound goal. That play seemed to wake the Spartans up as Alex Merritt led a charge into the 2nd period which found GBN scoring 4 goals in that stanza following up with 4 more in the 3rd period for a convincing 9-3 victory. In the 2nd game against Brother Rice the Spartans started quickly scoring four 1st period goals on their way to a 7-0 win. Alex Merritt again led the scoring with another 3 goal game. In order to advance to the Semi-Finals, the Spartans met up with Ohio power St. Edwards. The Spartans were again led by Merritt with 2 goals while his linemates Logan Nein and Chris Zhang each chipped in one a piece. The power play scored two goals in the game and the team defense stifled St. Edwards from start to finish. Naperville Central was next up for the Spartans in the semi’s. Central defeated host Loyola Gold to reach the game. The Spartans scored 30 seconds into the game by a goal from who else, Alex Merritt. Central responded with two goals to open up the 2nd period. Chad Yale tied the game on a give and go play with Merritt midway the 2nd period. Logan Nein would get the winner just a minute after Yale’s goal on a nice shot from in close. The 3rd period was scoreless thus allowing the Spartans to reach the finals for the 3rd year in a row. GBN would face Barrington in the finals. The Broncos had a terrific tournament by winning their bracket and then by upsetting New Trier Green 4-3 in double overtime in the semi-finals. Logan Nein opened up the scoring as he attacked the net with a short side wrap around and beat Bronco goalie Marcus Kunzman. The Broncos tied the game with a power play goal that hit off a Spartan shin pad with 2:48 to play in the 1st period. Barrington took the lead on another power play goal from the left point with 11:48 to play in the 2nd period. It looked like the Barrington lead would last as Kunzman and the rest of the Broncos locked down the Spartans with some tight checking. With time ticking down, Alex Merritt dug a puck out to Logan Nein who found Chris Zhang slightly open to the left of Kunzman about 20 feet out. Zhang let go a hard high wrist shot that found the right side of the Bronco net tying the game with 1:42 to play. The first overtime was played as a 5 on 5 with the best scoring chance coming from a pass from Merritt to Zhang but the shot went wide. The second ot was played 4 on 4. The combo of Fisher and Epstein sustained pressure inside the Bronco’s zone where Epstein came off the right board and Fisher went to the net to set a screen. Epstein let go with a high backhand shot that sailed over Kunzman with the game and tournament winner. This Championship marks the second title in the last 3 years for GBN. Shots for the game were GBN 52 and Barrington 26. The Spartans finished last week going 2-0-0-1. GBN defeated Fenwick in a SHL game by the score of 3-1. Although dominate throughout, the Spartans could only find the back of the net twice leading into the 3rd period. Fenwick would score on the very first shift of the period cutting the Spartans lead in half. Chris Zhang would score the 3rd goal with about 10 minutes to play to restore the two goal margin and GBN was then never really threatened. Culver Military Academy from Indiana came into Northbrook Saturday and GBN defeated the Academy 5-2. The line of Kyle Fisher, Joe Day and Alex Crane did most of the offensive damage. Fisher and Day each had a goal and Crane added two assists. The power play also went 2-4. Sunday night, Rockford visited Northbrook in an SHL game and out dueled the Spartans 2-1 in a shootout. Rockford took a 1st period lead. In the second period, Logan Nein on a power play ( 5 against 3) one timed a shot to tie the game. Rockford’s heavy checking disrupted the Spartan attack all night. The 3rd period was scoreless. Rockford would score the only goal in the 3 man shoot out giving the Icemen the extra point. Next up the traditional North South game at Glenview on Wednesday. 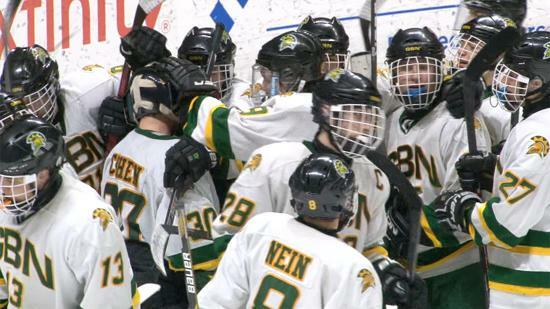 Glenbrook North and New Trier Green faced each other for the first time since the state championship game last year, Wednesday night, in a SHL tilt. Green won in a record setting shoot out by the score of 3-2. The Spartans took a first period lead on a goal by Chris Zhang who was set up nicely by Alex Merritt and Jared Epstein. GBN added a power play goal when Kyle Slovis snuck in on the right side of the ice and received a back door pass from Chris Zhang. With the game winding down, New Trier got on the board as a shot from the left point hit a Spartan defenseman and flew over the shoulder of goalie Garrett Cohen with 2:26 to play. Green pulled its goalie and with 26 seconds left another shot from the left point was tipped and eluded Cohen to tie the game. The large boisterous crowd witnessed the longest shoot out in SHL history. 17 rounds later New Trier had a comeback victory with a 3-2 edge in shoot out goals and an eventual 3-2 victory. 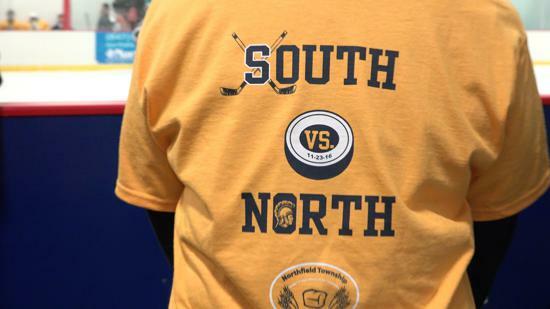 This past week found the Spartans playing two SHL games, Stevenson Wednesday night and Rockford Saturday. GBN was a winner in both games by the scores of 3-1 and 3-0. In the Stevenson game, the score was tied heading into the 3rd period, when Alex Merritt’s shot from the lefts side of the ice was deflected past Stevenson goalie Arye Furman just minutes into the period. Eric Doar would follow Merritt’s tally when he scored just 3 minutes later. Doar’s goal was set up by a rush provided by Kyle Slovis. GBN traveled to Rockford Saturday night and played maybe their most physical game of the season in handing Rockford a 3-0 loss. Defensively the Spartans were physical and their coverage spot on, limiting Rockford to just 15 shots for the game. Garrett Cohen best saves came in the 2nd period when a number of good chances by Rockford were blunted. Goals for the Spartans were provided by Chris Zhang, Logan Nein (PP) and Alex Merritt. GBN had a nice week of hockey starting off with a 6-0 shutout win over St. Rita. Garrett Cohen back stopped the effort with his goaltending while 6 Spartans tallied 1 goal each. On Saturday the Spartans defeated Saint Viator to earn their first Scholastic win of the season by the score of 8-1. Kyle Slovis 2(G) 1 (A) and Alex Merritt 4 (A) led the GBN offensive attack. 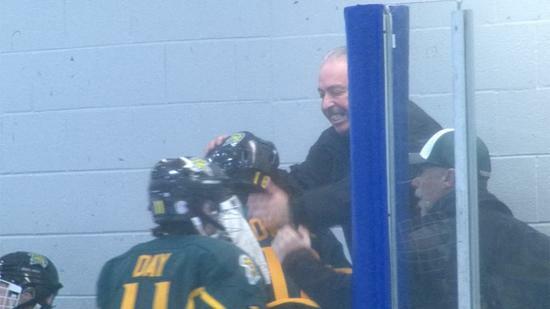 On Sunday GBN faceoff against the Northwest Chargers Midget Major team and defeated the Chargers by the score 5-3. Joe Day and Logan Nein each had 2 goals. Matt Rosen’s blast from the point which gave the Spartans the lead 4-3 midway through the 2nd, had the other score. The 3 wins pushes the Spartans record to 16-4-1 for the year. The Spartans posted two victories last week by defeating Sandburg by the score of 9-2 and Catholic league power Benet 3-1. 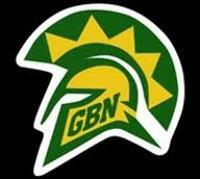 GBN wasted little time in the game against Sandburg by scoring (8) 1st period goals. Eight different players tallied goals in the game with Logan Nein scoring two. Again it was the first period scoring that did the damage against Benet. Goals by Chris Zhang and Jared Epstein gave the Spartans a two goal cushion in the first. Logan Nein would score a power play goal in the 2nd, assisted nicely by Epstein to finish the Spartans scoring. Benet broke the shutout bid of Brett Zera with a goal in the middle of the 3rd period but would never get any closer. The win pushed the Spartans record to 14-4-1. The opening of the SHL season has not been kind to the Spartan Varsity team. On Sunday, GBN traveled to Fenwick and again found themselves on the losing side of a 2-1 game while outshooting Fenwick 42-12. Fenwick scored on a power play goal in the 1st period as a shot from the left point deflected off of multiple shin pads and found its way in behind Spartan goalie Garrett Cohen. Spartan Chris Zhang had the best chance in the opening period as he took a cross ice pass from Chris Merritt while on a power play and with a somewhat open net rang the puck off the right post. GBN kept the onslaught up but Fenwick goalie Pino Barker time in and time out throttled the effort. Finally in the 3rd period, off a faceoff, Zhang found Merritt going to the Fenwick net and Merritt tied the game on a tap in. Just when you thought the Spartans would get going Fenwick answered just seconds later as the Spartans seemingly had control of the puck in their own end but misplayed it at their own blueline creating an odd man break to the Spartan net and the Friars made no mistake and finished the play to score the go ahead and eventual winning goal. 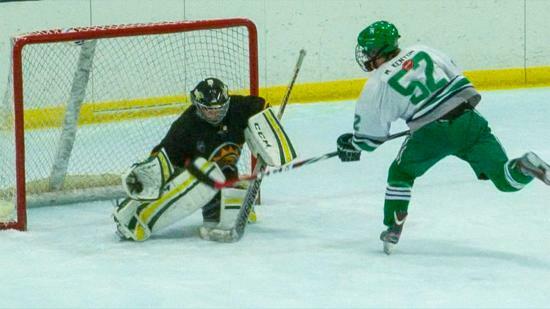 GBN was upset last night 3-0 by Barrington in the opening game of the 2014-15 SHL season.The goal keeping by the Broncos Marcus Kunzmann was spectacular at times, turning away all 30 GBN shots, some from point blank range. Barrington took the lead in the 1st period as the puck came off the end board at a strange angle and was picked up by Bronco Will Hood who lifted a backhand shot over Spartan goalie Brett Zera. The Spartans had constant pressure all night but could never dent the Broncos net. Barrington would score a power play goal with 10 minutes left and an empty netter with less than a minute remaining. Please be at the rink at 7:25 p.m. on Tuesday, September 9th, to be sized for warm-ups for the upcoming year. All JV players need to attend the 6:30 meeting tonight at the Northbrook rink. Registration for the upcoming season is now open. Please click on the registration tab to the left for a link to the registration site. Fourth of July: Float Building and Parade! 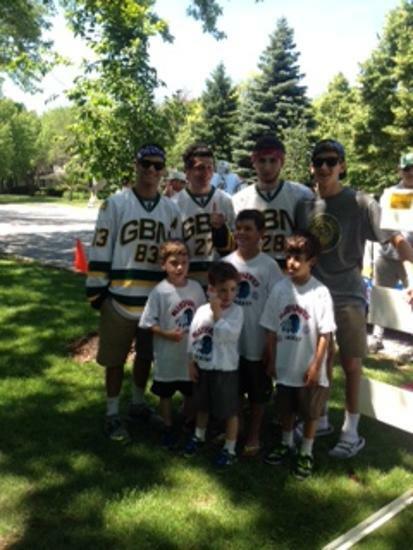 All GBN and Bluehawk players are invited to join the NBHL in Northbrook's July 4th parade. The parade is on Friday, July 4th at 2:30pm. This year's float is being decorated by GBN players and will start at position 58 (west of Western Ave.) on Cherry Lane. Please arrive by 2:15. 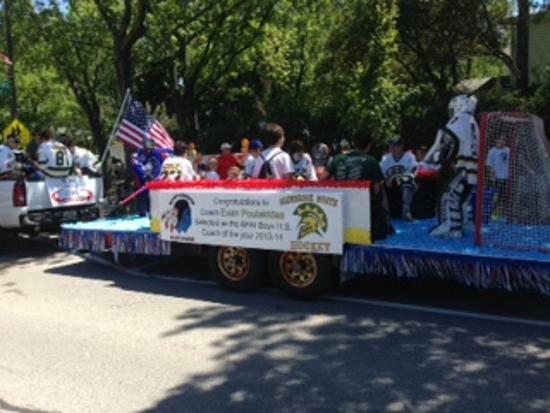 GBN players are invited to help build the float Wednesday and Thursday night. Float building will be located at Mark Zide's house, 3131 Toulon Drive and begin approximately at 5:30 on both nights. Our program will be offering summer hockey clinics with Blackhawks skating and skills coach Kevin Delaney and University of Michigan skills coach John Boultbee. Sign up asap if interested as clinics are filling up quickly. Information and link to sign up is on the Northbrook Bluehawks website. Click on the Image to See Highlights of the Championship Game Against Loyola Academy Gold! 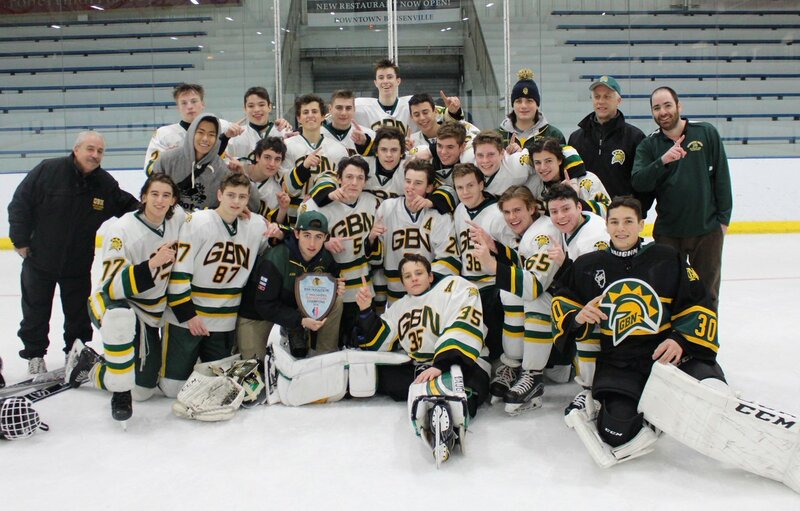 Congratulations to the Varsity Spartans on their Scholastic Hockey League Championship Win! Congratulations to Coach Evan for Being Selected as the AHAI Boys High School Coach of the Year! Spartan JV Team Wins The Scholastic Cup! 2014 Spring Registration is now open. Click on the Registration tab and follow the link to the registration site. You will need your players USA hockey number to complete registration. You do not need to get a new number if you have a valid number for the 2013/2014 season. 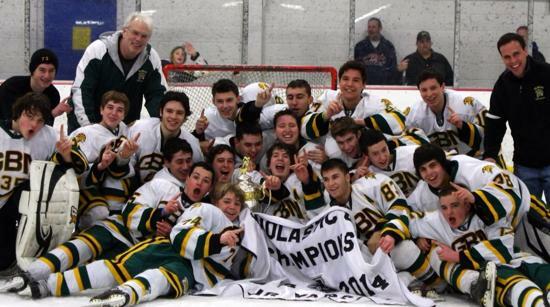 Congratulation to the Varsity and Junior Varsity Spartans for Both Winning the Scholastic Hockey League Title! Click to watch the video highlights! Congratulations to Varsity Spartans Nick Day, Nate Harris and Chad Yale for being selected for the 2014 All-State Team. Come watch them play February 3rd, at the AHAI hockey center in Bensenville at 8:35 p.m.
Also, congratulations to Nick Day and Chad Yale for being selected for All-League as well. 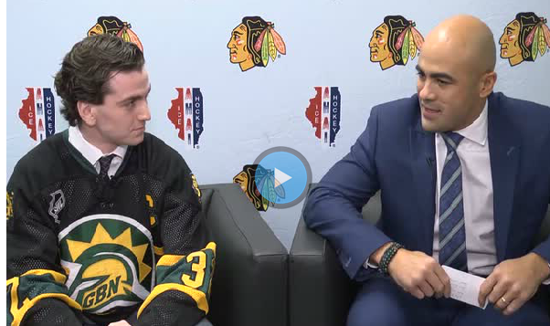 Glenbrook North's Nate Harris swears he doesn't model his game after any NHL players, but he does have a favorite: Patrick Kane. And like the Blackhawks star, Harris hopes he can end his season as a champion. Ask Nate Harris if he models his game after any professional hockey players and he’ll say no. He watches a lot of guys in the NHL and tries to take parts from each of their styles, but there’s no player he has set out to become. Watch Harris zoom around the ice for Gelnbrook North and you’ll see otherwise. The end-to-end speed, the sharp stick-handling, the ability to put the puck in the net from a variety of angles, a willingness to take on defenders to give a teammate an open shot. All of it reminiscent of a specific player, one who has earned some hardware for his skills on the ice. Then look at the back of Harris’ jersey: No. 88, of course. Harris is a Patrick Kane clone, with the ability to change the game on both ends of the ice. His skills as a goal-scorer, passer and defender, are a primary reason the Spartans are the Sun-Times’ No. 1 team. “Yeah, he’s my favorite player,” Harris said of the Blackhawks star. Like Kane, Harris has many responsibilities for his team. The main one is to create offense, something he does quite well. According to the team’s official web site, Harris has scored 35 goals to go along with 31 assists, both of which lead the team. A strong work ethic and attention to detail are responsible for his impressive play. The Spartans are more than a one-man team. 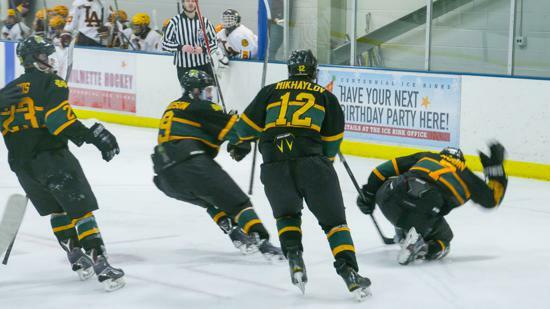 Glenbrook North coach Evan Poulakidas says that the team has four lines that can score and pass with skill, a rarity among the high school ranks. More importantly, the team defends as well as any in the state. The depth on the Spartans roster will come in handy, after Harris broke his scapula last Saturday. Out for at least a month, the team’s top player reluctantly will be forced to the sideline. The injury doesn’t change Glenbrook North’s big picture. It still has the most talented team in Illinois, with its top scorer hoping he can duplicate a feat of his favorite player and bring home a championship. Spartans Off to A Promising Start! The Varsity Spartans participated in the Central States Showcase and defeated three out of the four teams they played. Come out and support them on Saturday night, November 2nd, when they face Scholastic Hockey League opponent Stevenson. Former Spartan and current Pittsburgh Penguin Jayson Megna. Former Spartan and state champion Jayson Megna, scored his first goal and got an assist in his second NHL game for the Pittsburgh Penguins on October 28, 2013.